Savor each layer in our Layered Coconut-Chocolate Bars. A vanilla filling, walnut, coconut and chocolate make the layers of these coconut-chocolate bars. Perfect for the dessert table at your next gathering or as an on-the-go, packable treat! Line 13x9-inch pan with Reynolds Wrap® Aluminum Foil, with ends of foil extending over sides; spray with cooking spray. Microwave 5 oz. chocolate and 1/2 cup butter in medium microwaveable bowl on HIGH 2 min. or until butter is melted; stir until chocolate is completely melted and mixture is well blended. Stir in graham crumbs, nuts and 1 cup coconut; press onto bottom of prepared pan. Refrigerate 15 min. Meanwhile, beat cream cheese in large bowl with mixer until creamy. Gradually add milk, beating well after each addition. Add dry pudding mix; beat 2 min. (Mixture will be stiff.) Stir in 1 cup of the remaining coconut; spread over chocolate layer in pan. Microwave remaining butter and chocolate in microwaveable bowl 1 min. or until butter is melted; stir until chocolate is completely melted and mixture is well blended. Pour over pudding layer; tilt pan to evenly cover pudding layer with chocolate mixture. Sprinkle with remaining coconut. Refrigerate 2 hours or until firm. Use foil handles to lift dessert from pan before cutting into bars. 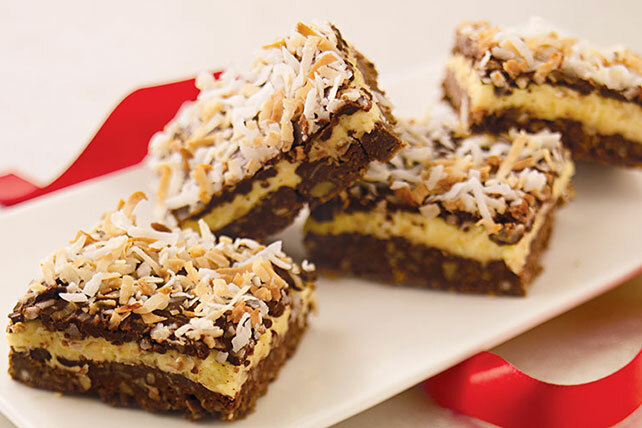 Enjoy the irresistible flavor of chocolate and coconut in these easy-to-make bars that make enough to feed a crowd. Heat oven to 350°F. Spread coconut in shallow pan. Bake 7 to 10 min. or until lightly browned, stirring frequently. Or, spread in microwaveable pie plate. Microwave on HIGH 3 min. or until lightly browned, stirring every minute. Watch carefully as coconut can easily burn.